All parts and fluids supplied, installed or serviced by Lube Mobile technicians. All labour performed by Lube Mobile technicians. Warranty service can be carried out no matter where you are in the country - our work is guaranteed nationwide. As a consumer, you have the right to have your new car serviced by whomever you choose, without that choice affecting the seller's statutory warranty obligations. Lube Mobile works precisely to manufacturer's specifications for new car servicing. 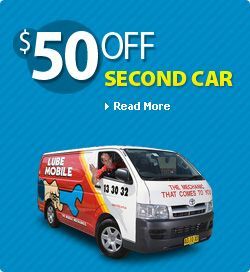 You get an independent warranty on parts and labour associated with your Lube Mobile service and repairs. We cover our work for 12 months or 20,000km, nationwide, and your statutory warranty remains unaffected. "A common concern for new car buyers is their right to have someone, other than the dealer, service the car without putting warranties at risk. Judging by the large number of calls received by the ACCC many buyers are uncertain. Remember you are not entitled to a refund if you change your mind or discover the product is cheaper elsewhere". By Professor Allan Fels, (former) Chairman of the Australian Competition and Consumer Commission.